When you are looking to find a home for your family, the traditional image is probably the one that first springs to mind: a nice house with a yard in a small neighborhood. But getting to the stage where you can own a home can be difficult, and that traditional picture does not always fit with the modern family’s day-to-day lifestyle. If you’re looking for an alternative to house living that could really provide your family with a high quality of life, considering moving to a luxury apartment. It can be next to impossible to find a home with all of the features you want; with a luxury apartment, however, ever amenity you could possibly ask for is already right at your fingertips. Harborside Village apartments come fully equipped to meet the needs of you and your family, without the headache and the hassle associated with house hunting. Within the apartment itself, you will find your own personal washer and dryer, a dishwasher, central air conditioning, gas or electric cooking and heating, storage space, and walk-in closets, on top of the spacious floor plan. The apartment community at Harborside Village has even more to offer; keep yourself and your family entertained with the tennis courts, swimming pool, and boating privileges that come with being a resident. The way we live is changing, and more and more families are opting for a new kind of lifestyle. Why not make your lifestyle a luxurious one? 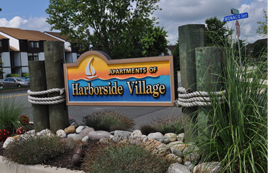 Call Harborside Village today to get started with your luxury apartment rental. This entry was posted on Wednesday, August 6th, 2014	at 5:51 pm	. Both comments and pings are currently closed.